Mr. 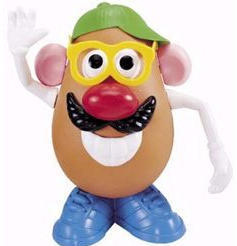 Potato Head comes with a variety of mix & match accessories. Pieces store inside built-in compartment. Mr. & Mrs. Potato Head are the timeless classics. Size (inches): 6.10" X 4.33" X 7.48"
We are thrilled that we can still order Mr. Potato Heads from somewhere, and the service provided by zooscape is fantastic! It is an exellent gift for anyone of all ages!